Hopefully you really hate rats and half-naked northerners. 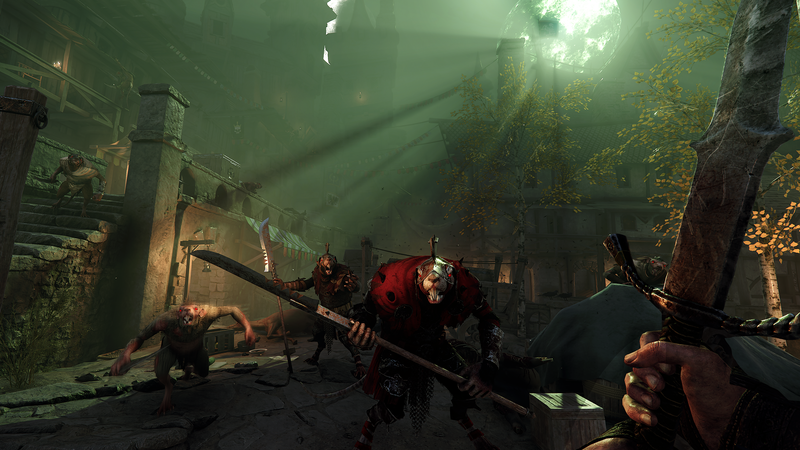 That’s the position that Warhammer: Vermintide II has taken, and it’s firmly sticking with it if the new Shadows over Bögenhafen DLC is anything to go by. Giant ratmen, northlanders and gatling guns, oh my. 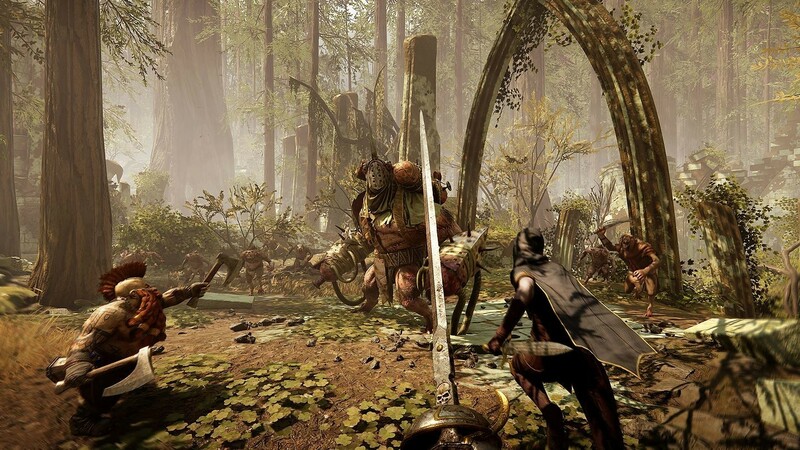 So if you didn’t know, Warhammer: Vermintide II is a game about trying to slaughter your way through wave after wave of enemies as you explore a variety of fantasy environments taken directly from the Warhammer universe. You choose from one of 5 heroes and slowly increase their level and equipment to make them the strongest dwarf/elf/witch/witch-hunter/human they can be. Shadows over Bögenhafen adds 2 new maps, several new challenges and a whole bunch of new cosmetic items to make your heroes and their gear look pretty rad. The maps are both set in Bögenhafen, another city in the Warhammer universe which happens to be on the ocean and also happens to be infested with some sort of flesh-rotting disease…oh dear. The main star of Shadows over Bögenhafen are the two new maps themselves: ‘The Pit’ and ‘Blightreaper’. 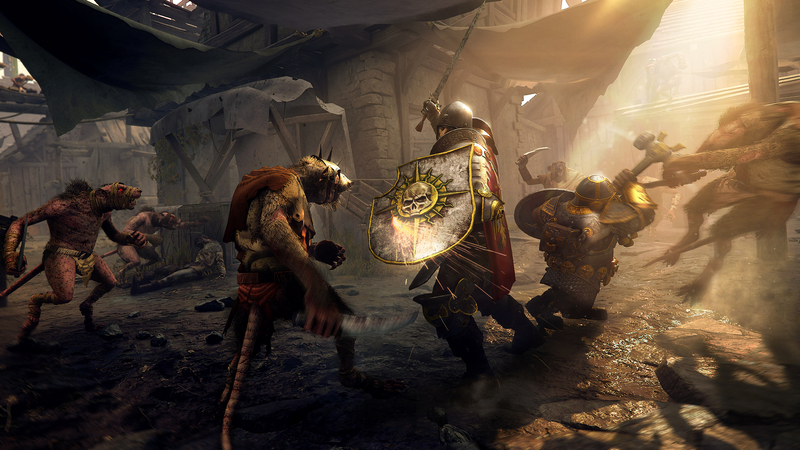 In the first you’re sent into the city to investigate the source of the aforementioned flesh-rotting plague, a job you apparently do the same way you perform every job in Vermintide II: by killing monsters. Blightreaper is a little different in that you’re trying to locate a strange sword which may or may not be evil incarnate. Both of the new maps in Shadows over Bögenhafen are a little so-so. While it is good to have two new areas to explore for those of us that haven’t stopped playing the main game since it came out, the effort put into the DLC feels a little lacking at times. Both of the maps take place in a pretty standard medieval-esque fantasy city, all rough-hewn stone and wood, which is a setting that the games have already explored to death. Even the new map gimmicks are hit and miss. 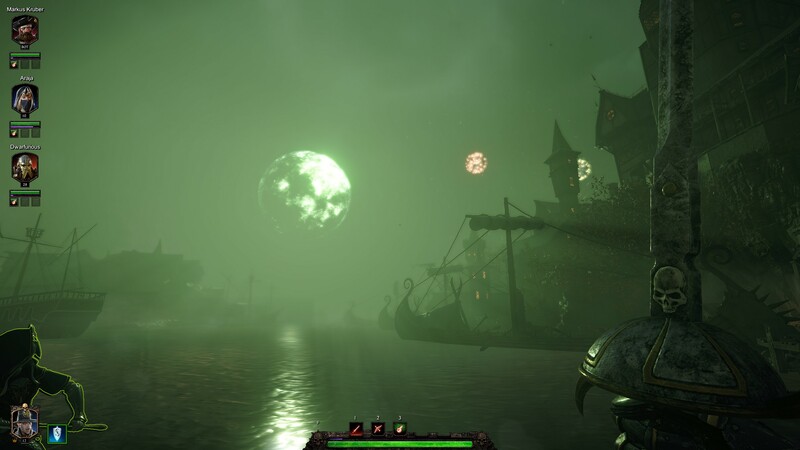 While the ending of ‘The Pit’ has an intense, death-defying sprint along the docks while a gatling gun sprays you with fire, ‘Blightreaper’ just re-uses the darkness gimmick from the last game’s DLC, Drachenfels. So with one level gimmick being good and one being bad, the new campaigns have left, at best, a bit of a bland taste in the mouth, but ‘Blightreaper’ definitely comes out as the worst of the pair. 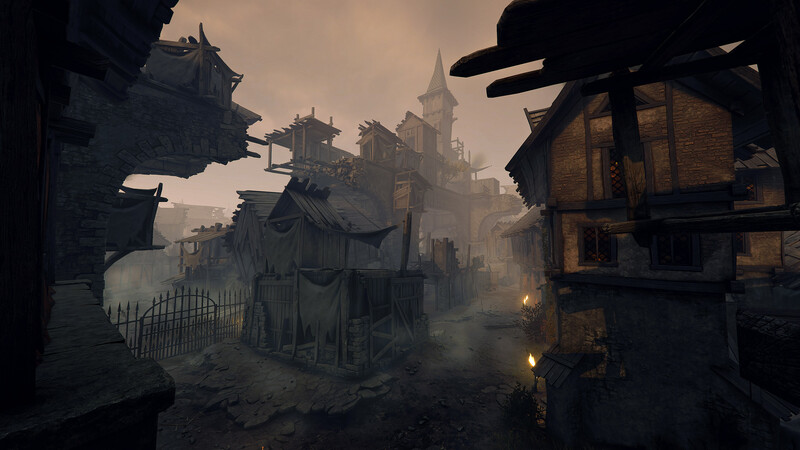 It’s filled with sprawling streets, which isn’t all that unusual, but it’s rare that you can become lost in a Vermintide map, and this map somehow makes it happen. Overall, if you had to pick one of the levels to play, we would recommend ‘The Pit’ every single time. Moving on from the maps, there are a few little bonuses to help spice things up. The new challenges added to the game’s pre-existing challenge system allow you to unlock a special new type of loot chest that contains cosmetic skins for your characters and weapons. Unlike the main chest system, the skins don’t apply for whoever you’re currently playing as and are instead applied randomly amongst the 5 characters. While this can be annoying if you get unlucky, it’s not too much of a complaint considering that the items don’t affect the gameplay, even if they’re nice to have. 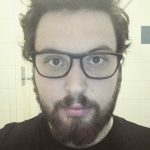 There’s overall not too much else to talk about with regards to the DLC directly. 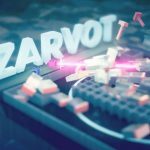 It’s relatively short and doesn’t contain too much new content, but then again, it’s got a small price tag that matches the level of content. So instead, we’d like to take the time to talk briefly about the community reaction to the DLC. 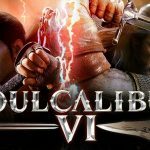 There has been a surprising amount of hate towards the DLC since it was released back in August, mainly due to the lack of content and the amount of time it took to be developed. It seems slightly baffling considering that this is an indie developer we’re talking about here, and on top of that, they’ve had to split their focus between DLC and porting the game to other systems, a fact that even one particular negative review on the game’s Steam page pointed out. Regardless of how you feel about it, the lack of content seems to be a silly point to get hung up on considering that the price is arguably scaled down to match it anyway. When all is said and done, Shadows over Bögenhafen is a bit of a mediocre piece of DLC, although not so much for its lack of content. The levels on display are a pretty even split of good and bad, the cosmetics are nice but have a rather janky delivery method, and the new challenges only serve as a way of getting the cosmetics, so they don’t really add or subtract anything substantial from the gameplay. Overall, the DLC is cheap and of acceptable quality. It’s not going to win any awards or anything, but it should tide players over until a hopefully more interesting DLC is released in the near future. 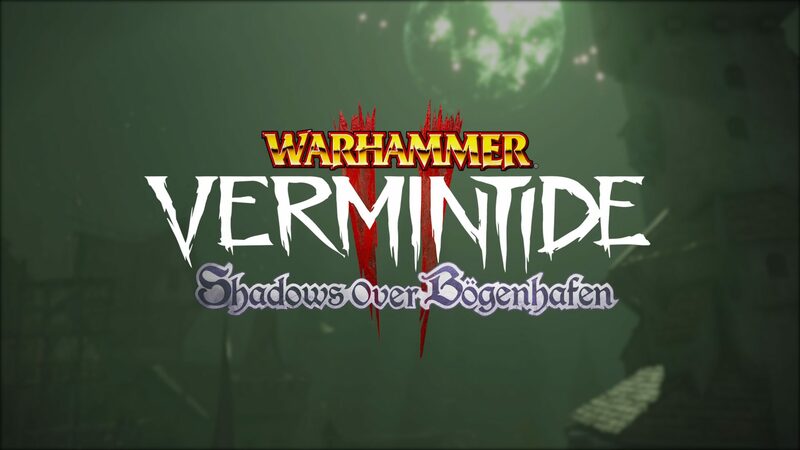 Shadows over Bögenhafen is a semi-decent piece of DLC that might not shine as strongly as the last game's DLC, but it is more than a worthy minor expansion to Vermintide II. While the delivery system for the cosmetic items might leave a bad taste in the mouths of some fans, the items themselves do add some much needed variety to the character models and their different careers. The DLC is far from a must-have, but if you've played the rest of the levels to death already, at least you can finally have something new to get on with.